Pasta e fagioli is one of the most popular Italian dishes. 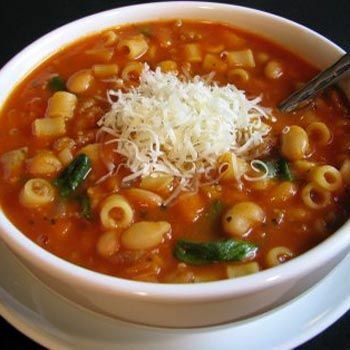 Pasta e fagioli is originally cooked with beans and pasta with no meat. It is basically a meatless Italian dish. Pasta e fagioli is Italian pasta dish but in United States it is commonly known as Pasta Fazool. So if you don’t like to have much meat in your meals, try this soupy Italian dish. Cannellini beans, borlotti beans and elbow macaroni are the actual ingredients of Pasta e Fagioli, however in Pakistan it might be difficult to find borlotti beans so go for Cannellini beans, mostly known as white kidney beans. Soak the beans for 3 to 4 hours. Boil the beans with simple water and drain out the water. Then boil the elbow macaroni and drain out the water. If you could buy tomato puree then it is good, otherwise boil tomatoes and blend the boiled tomatoes to make the puree. Heat the olive oil. Stir fry the chopped garlic until sauté brown. Add the tomato puree and oregano, basil, salt, pepper. Cook it for 5 minutes. Then add boiled beans and again give time to cook and to soak the tomato and taste in the beans. 5 minutes will be good enough to cook beans. Add the boiled elbow macaroni and cook for 1 to 2 minutes. In serving dish, put the Pasta e Fagioli and toss it with 1 table spoon olive oil. Add the grated Parmesan cheese and sprinkle parsley. Delicious Italian Pasta e Fagioli is ready to eat. Hope you enjoy this quick to cook but delicious taste recipe.